Last month I was lucky enough to visit the Biltmore Estate in Asheville, North Carolina. Biltmore was the country retreat built by George Washington Vanderbilt II of the famously wealthy Vanderbilt family. It was designed by architect Richard Morris Hunt and the landscape was designed by Frederick Law Olmsted, one half of the duo (with Calvert Vaux) who brought us Central Park in Manhattan and Prospect Park in Brooklyn. Biltmore was complete in 1895 and remains the largest privately-owned house in the United States. It was extremely crowded inside the main house so I didn’t enjoy it nearly as much as I would have if there had been less people, but I did have a great time at the nearby gardens and also at the Antler Hill Village & Winery, where my husband and I had a wine tasting featuring the wines produced right there at Biltmore and I got to see a gorgeous little exhibit called Fashionable Romance. 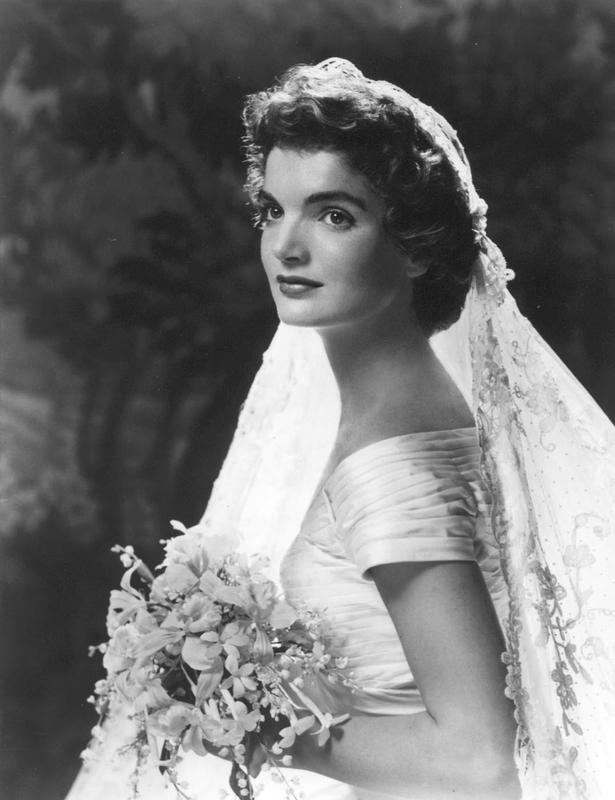 It focused on the wedding attire of Cornelia Vanderbilt, George’s only child, and on the Lee family bridal veil worn by both Jacqueline Bouvier on her wedding day in 1953, as well as her first cousin, Mary Lee Ryan, when she married Cornelia’s son (and George’s grandson), William A.V. Cecil in 1957. 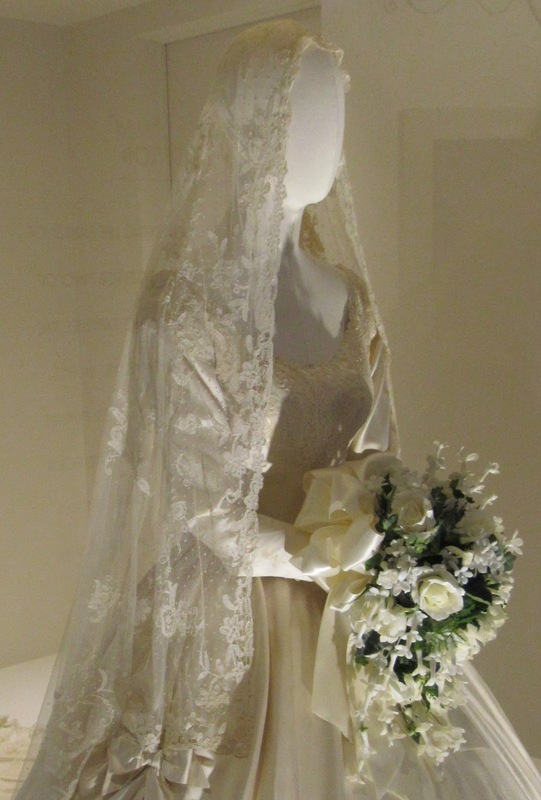 The Lee veil and the dress worn by Mary Lee Ryan. Unlike the Biltmore house, there weren’t too many people at the exhibit so I had no problem taking pictures! Mary’s dress was on display, along with the veil, and there was a video monitor showing the family footage taken on the day Jackie married JFK on September 12, 1953. Photo montage featuring Mary Lee Ryan wearing the veil. Jackie and her sister Lee at the wedding reception. 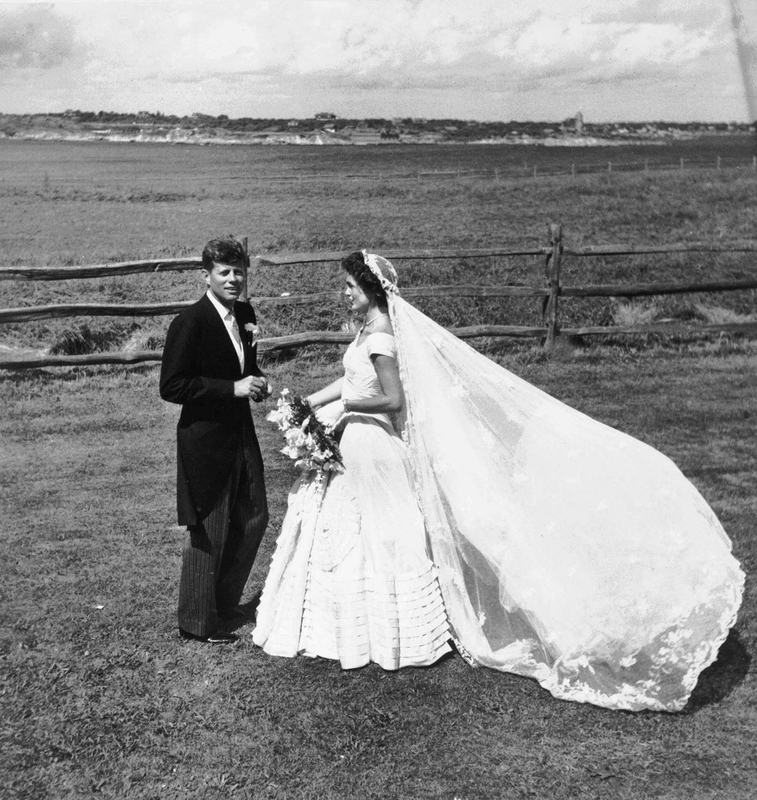 JFK and Jackie looking so happy on their wedding day! How lovely to know the beautiful rose point lace veil was worn by Margaret Merritt Lee when she got married in 1903, then worn by both of her granddaughters, Jackie, and Mary, and continues to be used in family weddings to this day! Jackie’s granddaughter, Tatiana Schlossberg, just got married this month, but I cannot tell from looking at the two pictures I have seen of her and her new husband whether she wore the veil or not. If you happen to know, do tell! The family chart below explained the connection between the Lee, Cecil and Vanderbilt families. The family tree explains the connections! Jackie looking very ethereal in her wedding gown and veil. The exhibit is open through the 2017-2018 Christmas season at Biltmore so if you get a chance to visit, I highly recommend it! There is a short post about the history of the veil, as well as the veil Cornelia Vanderbilt wore on her wedding day over at the Biltmore blog. Let me know if you have visited Biltmore and if so, what you thought of it! I hope I get to make a return visit some day. Lovely dress!!!! The Biltmore is amazing!!! I've only been once and I would love to go back and do the audio tour. The tulips in the spring are amazing! Let me know if you ever want to hang if you come to Asheville again! Sooooooo much good food & music here! What a nice exhibit at Biltmore. The estate itself is just beautiful. I would love to see it at Christmas someday. And would love to see that heirloom veil as well. Great post, Jill! What an interesting post. I'd no idea that JKO had a Biltmore connection. I've been fortunate to have visited Biltmore several times as a child and as an adult. It's stunning in every way---the house, the property, and the locale. Definitely visit at Christmas, when the house is decorated. The Cecil family have done a fabulous job of running the estate. Hi Janet, thank you for stopping by! You are so lucky to have been to Biltmore more than once! I would love to go at Christmas, I have heard from several people that it is spectacular. 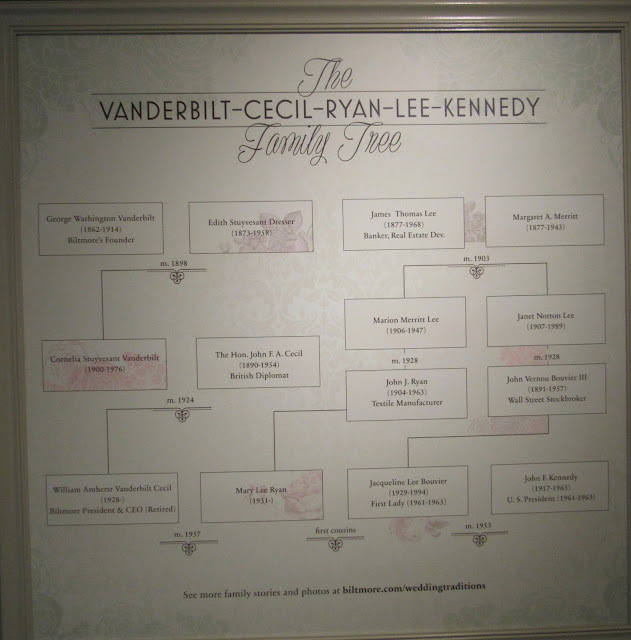 I did not know of JKO's connection to this branch of the Vanderbilts until I saw the exhibit. If you get a chance to see it you should go, it will be there through this Christmas season! All of the food at this place was totally amazing. I had multiple servings of the delicious lamb entrée. The wedding venues space is absolutely incredible. The breathtaking views of the city are absolutely incomparable and all the guests were completely amazed.